Have experienced so much joint pain in my left hip and knee and other strange areas of pain. Fatigue and dizziness. Just kept going because I have been researching on this D3/K2 thing. On Saturday night slept for 10 hours and awoke without any pain anywhere! Went to gym and worked out for 1-1/2 hours. Picked up 7 year old granddaughter and we went swimming for an hour and then went girl shopping for 2 hours. No pain and not tired! Walked hills for 40 minutes this morning and knee was not really painful but could feel that I had exercised. Last blood test showed that my normally alarmingly low anemic blood count had doubled….got up to 27. Will get next blood test October 4th. You are probably saving my life, if not curing CLL. Will keep you posted. 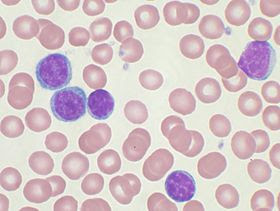 B-cell chronic lymphocytic leukemia (B-CLL), also known as chronic lymphoid leukemia (CLL), is the most common type of leukemia (a type of cancer of the white blood cells) in adults. CLL affects B cell lymphocytes, which originate in the bone marrow, develop in the lymph nodes, and normally fight infection by producing antibodies. CLL is a disease of adults. Most (>75%) people newly diagnosed with CLL are over the age of 50, and the majority are men. However, in rare cases, it can occur in teenagers and occasionally in children. Some of these may relate to an inherited predisposition. Most people are diagnosed without symptoms as the result of a routine blood test that returns a high white blood cell count, but, as it advances, CLL results in swollen lymph nodes, spleen, and liver, and eventually anemia and infections. Early CLL is not treated, and late CLL is treated with chemotherapy and monoclonal antibodies. DNA analysis has distinguished two major types of CLL, with different survival times. CLL that is positive for the marker ZAP-70 has an average survival of 8 years, while CLL negative for ZAP-70 has an average survival of more than 25 years. Many patients, especially older ones with slowly progressing disease, can be reassured and may not need any treatment in their lifetimes. HI i.m a man 73 have cll lukimia for 9.5 yers now my doctor found few limp nodes neck and under arms. doctors want me to have bone marrow biopsy i.m scare of it what do you think about it . thanks in advance.